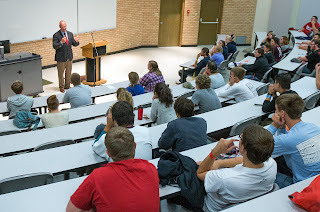 Last week during our Kick Off Weekend activities, students had the privilege of being welcomed to campus by Governor Matt Mead. He talked to them about the importance of a college degree and how they are an investment in the future of Wyoming. Following his presentation to the students, he also spoke to NWC faculty and staff. He understands that community colleges are key to the future of the state and he congratulated us on being the first community college in the state to complete the first round of articulation agreements with the University of Wyoming. He also gave us his perspective on the state's budget situation. It was an honor to host Governor Mead on our campus. He truly cares about our future and appreciates that we are making a difference in the lives of our students.